Ashley and Rachel Caton and family are pictured with their latest Skipton NEMSA champions, joined by sponsor’s representative Karen Horsfield. Ashley and Rachel Caton maintained their dominance of the local NEMSA show arena by presenting the title-winning pen of 10 gimmer lambs for the second year in succession, while Alan Lodge and family landed a fourth consecutive championship success in the pens of 20s. 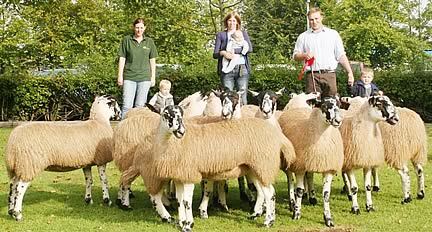 Action in the ring at the latest Skipton NEMSA show and sale. Furthermore, the Catons, of Otterburn Lodge Farm, Otterburn, were following up on a memorable double at the opening NEMSA show a fortnight earlier, when they exhibited both the champion pens of 10 and 20 lambs, the former for the fourth year in succession. Their latest victors sold for £140 per head (£115 in 2009) to Ben Harvey of Waxham, Norfolk, while the Lodges, of Westside Farm, Malham Moor, saw their triumphant pen of 20s achieve £131a head (£118 last year) when knocked down to co-judge Cameron Walton, Hellifield. 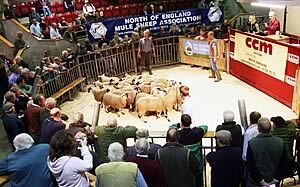 The predominantly moorland-reared lambs, well suited for both running and covering, were again presented in fine fettle for the season’s second major ewe lamb show and sale for members of NEMSA, which has been staging its twice-yearly fixtures at Skipton for 26 years. Joe, Nancy and George Throup are pictured with their top price pen at the latest Skipton NEMSA fixture. As at this year’s opening NEMSA show and sale, Joe & Nancy Throup, of Draughton, took top price honours when their second prize pen of 10 sold for £150 each to Claire Morris, Barnard Castle. It capped a good day for the Throups, who sold six pens in total at prices from £100 upwards, their 90-strong consignment of lambs also heading the flock averages at £109.28. 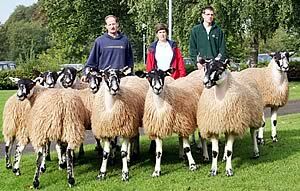 The Lodge family had further impact when leading the flock averages for 100 or more lambs at £106.80 per head. A packed ringside of customers from throughout England and Wales ensured keen bidding for the 6,890 lambs forward, producing an overall selling average of just over £90, an increase of £18.05 on the corresponding sale last year. The second co-judge in the 10s, competing for the J Marsden Perpetual Trophy, was Roger Green, Bashall Eaves, and in the 20s, competing for the WCF Perpetual Trophy, Andrew Shorrock, Goosnargh, and Colin Whitelock, Gargrave. The show was sponsored by Pearson Farm Supplies, West Marton. Main prize awards and per head prices: Pens of 10 – 1 AV Caton, Otterburn, £140, 2 JC&N Throup, Draughton, £150, 3 KM&L Throup, Silsden Moor, £128. Pens of 20 – 1 & 2 A Lodge, Malham Moor £131, £120, 3 KM&L Throup, Silsden Moor, £105.